Crowley Maritime Corp. has taken delivery of Taíno – the second of two of the world’s first combination container/roll on-roll off (ConRo) ships powered by liquefied natural gas (LNG) – from shipbuilder VT Halter Marine Inc., of Pascagoula, Miss. Taíno will soon join sister ship El Coquí, which was delivered in July, in providing fast, reliable and environmentally friendly shipping and logistics services between Jacksonville, Fla., and San Juan, Puerto Rico. This major milestone marks the final chapter in construction of Crowley’s $550 million investment in the two newly built, Commitment Class ships and associated port upgrades. The resulting ships and port facilities have elevated the company’s Puerto Rico supply chain services to world-class standards as a new era begins in the company’s longtime logistics services for the island. Taíno, like El Coquí, will be operated by Crowley’s global ship management group. She is scheduled to make her maiden voyage to San Juan on Jan. 8 from her dedicated U.S. mainland port in Jacksonville, JAXPORT. 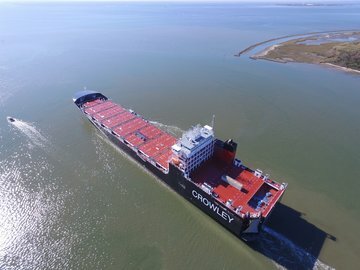 The new Crowley ships, built specifically for the Puerto Rico trade, are 219.5 meters (720 feet), 26,500 deadweight tons (DWT), and can transport up to 2,400 twenty-foot-equivalent container units (TEUs) at a cruising speed of 22 knots. A wide range of container sizes and types can be accommodated, including 53-foot by 102-inch-wide, high-capacity containers, up to 300 refrigerated containers, and a mix of about 400 cars and larger vehicles in the enclosed and ventilated Ro/Ro decks. This type of shipboard garage is offered exclusively by Crowley in the trade. Construction was managed in the shipyard by Crowley Solutions. This team included naval architects and engineers from company subsidiary Jensen Maritime. Taíno is named for the native Puerto Ricans who lived off the land with great appreciation and respect for their environment, and El Coquí is named for the popular indigenous frog on the island. Fueling the ships with LNG reduces emissions significantly, including a 100-percent reduction in sulphur oxide (SOx) and particulate matter (PM); a 92-percent reduction in nitrogen oxide (NOx); and a reduction of carbon dioxide (CO2) of more than 35 percent per container, compared with current fossil fuels. Working with Eagle LNG Partners, the ships are bunkered from a shoreside fuel depot at JAXPORT. The company’s Isla Grande terminal upgrades included a new 900-foot-long, 114-foot-wide concrete pier and associated dredging needed to accommodate the two new ships; three new ship-to-shore gantry cranes; expanding terminal capacity for handling refrigerated containers; paving 15 acres to accommodate container stacking; adding containers and associated handling equipment to its fleet; installing a new electrical substation to provide power for the new gantry cranes; constructing a new seven-lane exit gate for increased efficiency; installing hardware required for a new, state-of-the-art terminal operating software system, and more. The Jones Act is a federal law that regulates maritime commerce in the United States. The Jones Act requires goods shipped between U.S. ports to be transported on ships that are built, owned and operated by United States citizens or permanent residents. Also known as the Merchant Marine Act of 1920, the law is vitally important to maintaining a strong U.S. maritime capability. Details, photos and videos about the achievement constructing the U.S. Jones Act ships and related upgrades under the Commitment Class project can be found at this project microsite .